This cultivar originated from seeds obtained from A. P. Stevenson Morden, Manitoba, was grown and selected by Adolph Heyer, Neville, Saskatchewan, and introduced commercially in 1950. The tree is moderately vigorous, open spreading with wide-angled, strong branching habit.. It is very hardy to zone 1, annually productive and very resistant to fire blight. 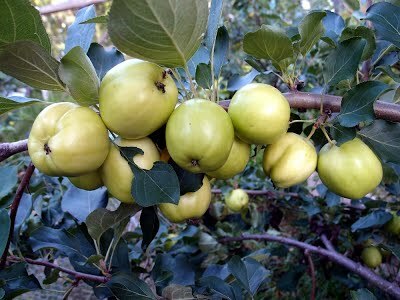 The fruit is medium size, 5-6 cm (2-2½ ") in diameter, near round in shape and matures in early season, about mid August. The stem cavity is medium deep, the basin shallow, and the pedicel (stem) is long and slender. The skin is very thin, completely greenish-yellow to straw coloured at maturity. The flesh is near white, medium coarse, bland and acid. It is poor for fresh eating and only fair to good for cooking since it oxidizes (discolours) rapidly, but deemed by most as good for pies and sauce. It only stores from 1-2 weeks. Note: Fruit should be picked before full maturity for storage or culinary uses.